February 14, 2013 – PopUpDisplay.com has re-launched its business as an e-commerce store featuring a large selection of pop up displays and accessories. Products are available in a wide variety of shapes and fabric colors, while custom-shaped pop up displays are available for customers to stand out among the many displays at trade shows. Set to go live on February 14, the website enables customers to shop for items within its collection by shape, size, color, and graphic options. Pop up displays and banner stands as well as modular and tabletop displays are available. All are suitable for use at trade shows, any point of purchase, and at any event intended for marketing or advertising or to hold a presentation. Start at the guide to see most of the options. With the re-launch, the company is offering customers eligibility to receive $100 off on any pop up display. Special offers are provided by email for visitors who sign up for the newsletter on the website. In addition, the company provides custom shaped and size pop up display tailored to customers’ needs. 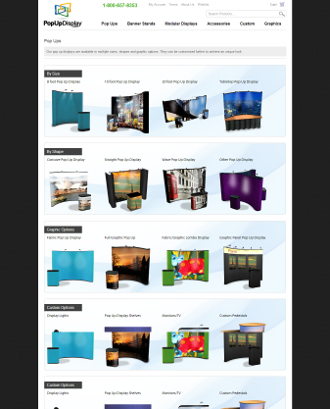 All pop up displays have free ground shipping and are guaranteed as high-quality products suitable for multiple reuse. Pop ups are available in multiple sizes as are numerous accessories such as display lights, shelves, monitors and TVs, and pedestals. Hanging banners are also available to use at trade shows, warehouses, and other open buildings. These and other hanging signs come in oval, round, rectangular, square, and other shapes. A general search feature lets visitors quickly find what they are looking for. Also, a “Featured Items” drop down menu on product pages allows new and bestselling items to be easily found and for users to see products listed alphabetically, by price, or according to their average review rating. An integrated tool for comparing select items is also available. The re-launched PopUpDisplay.com will be fully up and running on February 14. More information is available at popupdisplay.com. PopUpDisplay.com, a company in the printing business for 45 years, is re-launching its e-commerce website on February 14, 2013. Using digital printing, the company produces numerous types of displays, made in the USA, for trade shows and other events, and provides superior customer service. Quality printing is provided for all products, on a timely basis and at a reasonable price.